Thousands urged lawmakers to vote against tougher gun control laws. Thousands of gun rights advocates, including the state's gun manufacturers, filled the halls of the Legislative Office Building on Monday in an effort to put pressure on state lawmakers to vote against tougher gun control laws. Advocates said responsible gun owners will be punished if new laws are passed. "Everybody here today is all about gun safety," Peter Castonguay, a gun owner from Tolland, said. "Everybody here is trained. They've taken the courses and classes." Legislative leaders plan to meet again today behind closed doors to discuss new gun laws in the wake of the shooting at Sandy Hook Elementary, where 20 students and six educators lost their lives. "Every day that we have another meeting is a sign of progress," Republican Leader Rep. Larry Cafero, said Monday while walking into the third meeting. "If there was no progress, we wouldn't be meeting." Gov. Dannel Malloy has already announced his proposals, including banning assault-style weapons and high capacity magazines. Despite meetings with the governor's office, many of the state's gun manufacturers have said they would consider leaving Connecticut if tougher gun laws are passed. "If the legislature's final move ends up being something that doesn't allow me to opperate my business in the state than I'm really left with no choice," Jonathan Scalise, owner of New Britain-based Ammunition Storage Components, said. Scalise adds that he prefers to stay in the state. He employs about 70 people at his New Britain factory. He said the focus should be on gun locks, more intensive background checks and more training for people looking to purchase firearms. "The industry is behind the legislature 100 percent when it comes to the issue of safety and common sense solutions," Scalise said. 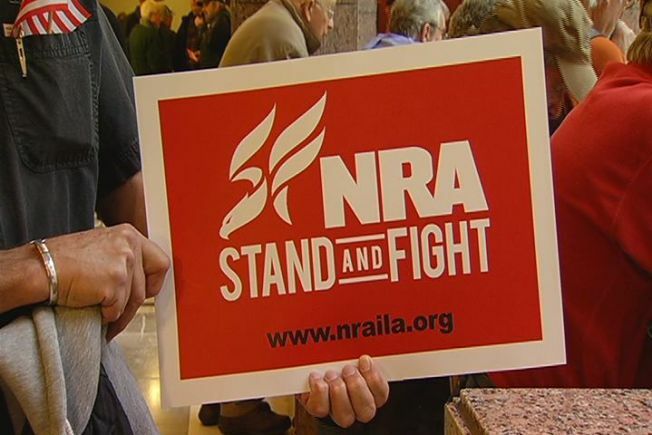 The National Shooting Sports Foundation, which organized the day, estimated 3,000 people showed up at the LOB on Monday.